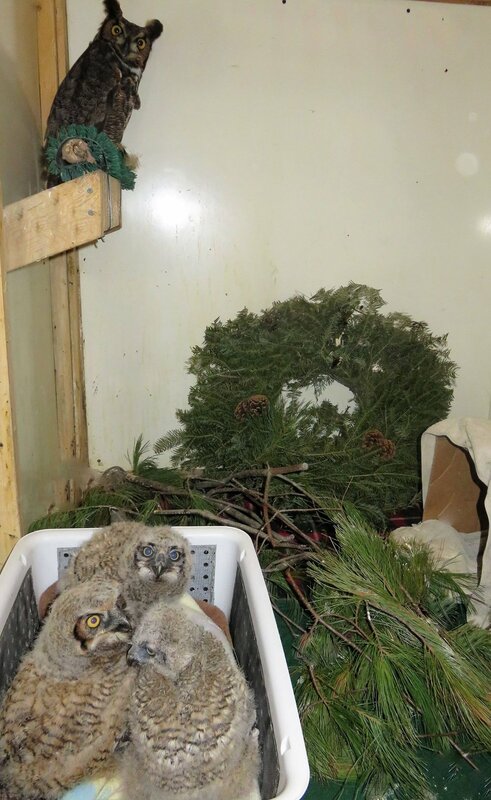 Four Baby Great-horned Owls — Raptor Education Group, Inc.
Our young Great-horned Owl owlets are growing! Two are from Duluth, Wildwoods Wildlife Center, and now both weigh over 800 grams. Two more were admitted this past week, one from Athens and another from Fond du Lac. The chick from Athens is thin, but is getting supportive care from staff and is on heat to stay warm and is making progress. The chick from Fond du Lac fell from the nest and was unable to be re-nested. The owlets get physicals and weighed periodically, but have minimal contact with humans. Our resident foster dad, a non-releasable Great-horned Owl, feeds and cares for them to insure that they imprint on their own species instead of on humans.